We are excited to invite you to gather with extraordinary women for a weekend of tracking wildlife, ecology, and your internal landscape. The high desert of Cuyama Valley offers incredible biodiversity of animals, habitats, and culture. “Cuyama”, a word derived from the Chumash word kwi: ‘ja:mé loosely translated means, “to rest” or “to pause”, an ideal sentiment for tracking animals or your own curiosities. Each day will be spent exploring track and sign, trailing animals, and indulging in art and self-care, coupled with good food, starry nights around a fire, and a nurturing landscape that encourages us to slow down. We hope you find the time to join us! 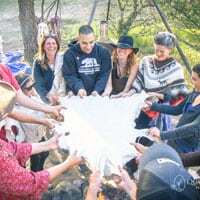 For this year’s gathering we will be tent camping in a secluded canyon with burbling springs in the high desert of Cuyama Valley, hosted by Quail Springs Permaculture. Days will be warm with cool nights and clear starry skies. While sleeping in a tent is not necessary, we suggest you bring a tent with all the cozy accoutrements that help make your night restful. The campsite is equipped with water saving, soil generating composting toilets and hot showers will be available. In the daytime, when we are not in the field tracking, we will be under the shelter of shade trees and canopies. At night, we will gather under the stars around a fire before snuggling into our sleeping bags. Our meals, prepared by Jamie Shulander (Chef and Baker Extraordinaire), will consist of produce and meats provided by Quail Springs, as well as other goodies attained from local sites and farmer’s markets. We are committed to local and regenerative practices that work for the health of both humans and all the other species we share our space with. We can provide gluten-free, vegetarian and vegan options, but let us know well ahead of time so we ca try to accommodate your needs. 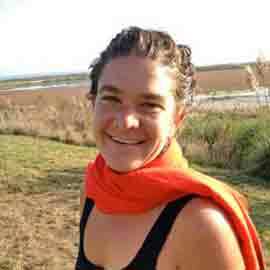 Meghan is a wildlife ecologist, tracker, and an instructor of both young people and adults and has spent the past 20 years dedicating herself to the art of wildlife tracking. This dedication has now become the lens through which she moves about the world. Tracking continually teaches Meghan to get out of her own way and observe what is beyond herself. If we reach a minimum of 15 people, we will be offering two work-trade positions at half price. Those work trade folks will help Jamie in the kitchen, help with set-up and breakdown of camp, refill water, and tend camp. We do not want finances to be the reason you cannot join us. So please Contact Us to discuss payment option plans. Payment and registration is being facilitated by the organizers of the conference and not Quail Springs. If you have a comment or question about this course please click here to contact us and we’ll get back to you soon. Quail Springs is deeply honored to welcome some of our most treasured storytellers, wisdom keepers and musicians for a magical feast of story and song under the stars of Cuyama. Come and celebrate the beautiful seeds of culture that bring us together as we gather by the fire to listen, remember, learn and sing. Join us for a fun and cozy weekend of making beautiful handmade holiday gifts! 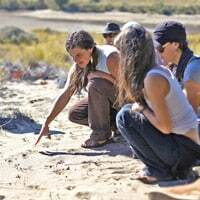 In this two-day class, students will have the opportunity to learn a variety of small crafts under the mentorship of several skilled Quail Springs stewards. Using mostly natural and simple materials, many of which have been locally hand-harvested and prepared by our teachers, you will have the opportunity to create several projects from a range of possibilities. Beautiful footwear made sustainably from natural materials has been worn by human beings for thousands of years. 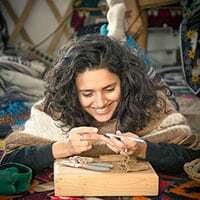 In this class students will create a pattern customized to their own feet, and learn to craft a pair of short moccasins using genuine brain-tanned buckskin and vegetable tanned leather. This will be a two piece style moccasin, with a harder sole for longer wear. The foundations of this pattern can later be applied for making many other styles of moccasins, including boots of all lengths. Blacksmithing is an ancient form of alchemy, bringing together fire, metal and air to birth functional and beautiful items that we depend upon in our daily lives. Instructor Justin Starting has been inspired by the way tribal blacksmiths use the simplest methods and materials to forge the highest quality tools. He believes that we can look to their traditional relationships with blacksmithing to bring consciousness and harmony back to our connection with metal. This class is designed to explore our ancestors’ relationship to the land through the art of traditional hunting. By cultivating this relationship of respectful exchange, we can deepen our understanding of what it means to live sustainably and remember our place in nature. The Sacred Hunt will be a combination of instruction, group discussions and hands-on experience in the field. Explore the delicious, fragrant and storied California landscape by learning to identify edible, utilitarian and poisonous species. Students will become acquainted with much of the local flora of Burges canyon and begin to develop real relationships to the world of plants. In this two day class we will dive into cuisine, culture, history, natural living skills, and stewardship. Classes include meals featuring traditional recipes that integrate wild foods. Join us for a 2-day intro to copper and silver forging! Led by local metal smith Justin Starting, students will begin by forging a copper bracelet and then will forge a silver bracelet out of a 1 oz. silver bar. If time permits we will be able to work with copper more, forging other projects. Have a comment or question about this course? We’d love to hear from you! Please fill out our form and we’ll get back to you soon.